Safari does in-fact have some handy debugging tools for web developers (DOM Tree, User Agent Spoofing, etc), but they are all hidden and disabled by default. 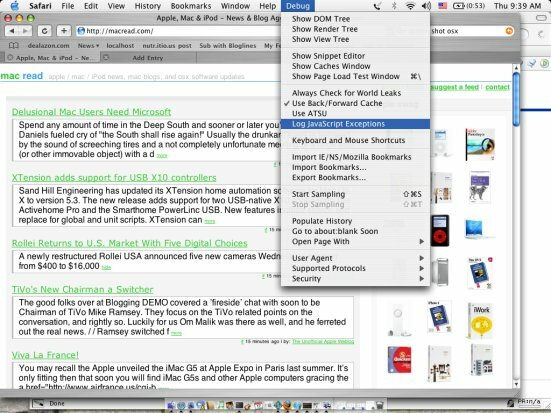 The easiest way to turn on the debugging menu in safari is by installing Safari Enhancer. 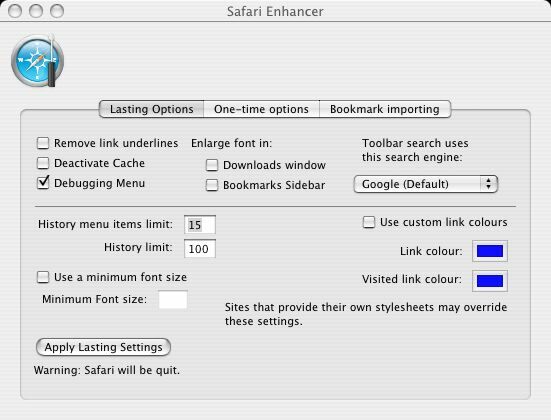 Make sure you check the box Debugging Menu, you can see that there are also some other handy features in Safari Enhancer. Click Apply Lasting Setting when your done. 10 people found this page useful, what do you think? Well, if you call things like ":TypeError - Undefined value" a useful error message... No line number, no source code, nothing useful really. how about this: (event handler):Undefined value yeah, that's greatly helpful. Thanks Apple! It seems like the Page Load Test and "Sample" files that Safari generates might be handy, but I can't find any information on how to use either of these capabilities that appear in the Debug menu. Does anyone have any information on how these features work? I get "SyntaxError - Parse error Line 1". Really useful. </sarcasm> Considering that Safari's scripting support is pretty-much as non-standard as any other browser, they should really include decent debugging tools if they expect anyone to support their platform.